Our Large Sisal collection is proving to be extremely popular, sisal is a natural fibre found all over the world, this makes sisal rugs green and Eco friendly. 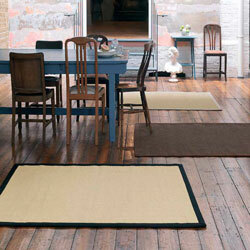 Sisal has many uses which include rope making to dart boards, due to the nature of sisal it is strong and hard wearing. This range has an anti slip latex backing and a cotton border.